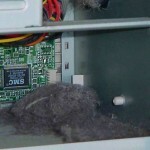 The spirit of this blog is to help you help yourself, this Clean Your Computer post will explain a common yet avoidable cause of death for many computers; dust. About twenty years ago a Fram Oil Filter commercial advised that “You can pay me now or pay me later?” I will add a third option: you can save your money this time. I would be happy to do this cleaning for you but if you would like to take charge of a small bit of maintenance that can add years to your computer’s life I can help you in that way too. Chili Cheese Frito crumbs in the keyboard and Pepsi Max over-spray on the LCD screen are easy to see and remove. Turn off the machine, turn the keyboard over, the crumbs fall out. A damp lint free cloth to the LCD screen and done. It is what you don’t see that will cause problems. All we are is dust in the machine. Well tiny bits of us, and various material we can’t even see are floating around in the air, and many of those dust particles will make their way into the machine through the intake vents. After a while the dust collects on certain components. I don’t know why dust lands where it does. Gravity? Air flow physics?Eeny Meeny? I’m sure that guy from the show Numbers could come up with an algorithm to explain why lint lands where it does and how a computer ends up looking like the photos even though it lives in a relatively clean house. It doesn’t matter though. 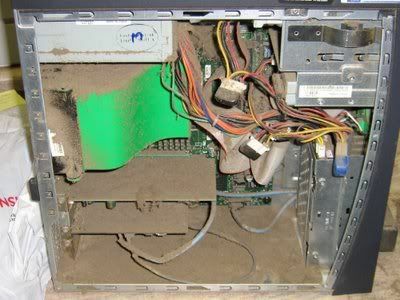 I just know the dust has to go in order for a computer to breath, operate, cool down, and live a long productive life. 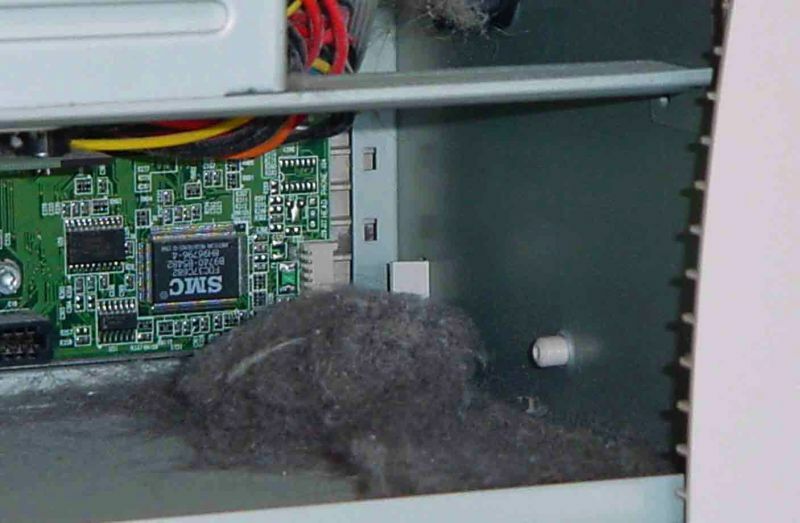 Got to clean your computer. • Processor Temperature – The millions of functions zipping through the processing brain of the computer generate much of the heat inside the case. Excessive heat shortens the processor’s life. In the mean time fail-safe features built into motherboards will shut down the computer without warning when a certain temperature is reached. Usually just before you click save in your project. • Half Baked Wiring – Prolonged excessive heat dries out insulation on the wiring making it brittle, then cracks form, voltage leaks, and short circuits may occur. 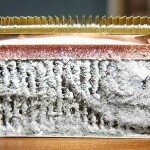 • Dust + Moisture = Mayhem – Condensation or humidity in the air, when combined with the dust particles landing on the computer boards, can create a path for electricity to arc across two points that were not designed to share voltage so directly. This brief encounter usually results in a black spot appearing on the motherboard, a distinct odor in the air, a blank monitor screen, and a heart sinking silence in the room. This rule of nature works on all electronics, like a beloved 32″ RCA television that just goes dark in the middle of a football game for instance, so maybe check your other devices for dust while you’re at it. • For the Gamers – Folks that do not understand the benefits of time spent in a virtual game world sometimes will banish computer game players, and the occasional LAN party, to the dusty dirty basement or garage/fun room. 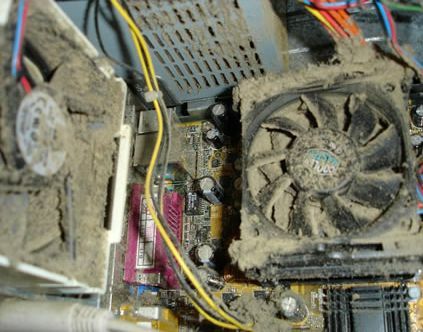 No matter where a gaming computer lives there is additional heat, therefore additional cooling fans sucking in humid air, and a more rapid accumulation of caked on filth occurs. Today’s video cards have their own processors and memory which generate additional heat; a lot. Over-clockers know that raising the performance levels of the video card beyond a given point will result in game freezes, artifacts laying about, and system shut-downs at precisely the wrong moment in the game. Cleaning the entire case environment of dust, as well as the heat sink and fan on the video card of course, will allow for shut-down free over-clocked gaming and extended life for that $400 gaming card. • The Power Supply – There are few moving parts in a computer, the fan inside the power supply is one of them. Just inside the case, at the point where you plug in the cord from the wall outlet, is the power supply. It converts house current into computer current. This process generates heat. The heat is dissipated by that fan built into the power supply. When dust gets inside the unit and slows or stops the fan, or when dust clogs the slots that fresh air enters through, the fan stops blowing cooling air across the heat generating transformer and catastrophe is eventual. I have replaced many power supplies for customers and have had a few expire on me as well. If you wake up one morning, push the button on the computer, and nothing happens, the power supply a likely and affordable suspect. It is usually only then that people see the inside of their computer and no longer need to read this article. to the compact construction cramming things on top of each other. There is a channel designed into the system with a dedicated fan pushing the hot air out. If the fan grill is clogged with dust, not only will the heat lay around inside cooking the critical components, but the fan will shut down the laptop or burn itself out trying to work through the crud. 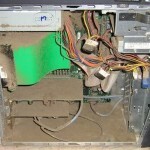 Until the manufacturers put a sneeze key on the laptop you will have to help the fan by removing dust from its airway. This post is already turning into an article, and if I am to avoid it becoming a novel, I will have to save cooling topics such as active/passive heat sinks, positive/negative air flow, conductive/radiative cooling, exotic thermal conductive compounds, round cable usage, etc., for another post. In fact, I believe this post needs to be broken up into two parts, understanding the problem, and then dealing with the problem. I didn’t know there would be two parts when I started this post, there was no intent to string you along, but there are a couple of reasons to split it up. First, it’s getting longer than intended. You probably didn’t even read this far. Then there is the secondary purpose of this blog, other than trying to provide a service, to increase visibility in order to be found more often in searches. That’s the plain fact of the matter. The more posts the better. Please understand the balance of trying to help you and trying to help myself, and then we can just move on to Clean Machine Part II, where you get your hands dirty. This entry was posted in Do It Yourself and tagged computer, cooling, DIY, maintenance, scheduled maintenance by Steve. Bookmark the permalink.